It’s been almost half a year since we’ve decided to reboot the Belgian Creative Commons affiliate. During these last couple of months we’ve been busy to get organised, reconnect with the different communities and setting up this website. So now I’m pleased to announce that we are once again an official and fully operational Creative Commons affiliate. On top of that, Creative Commons worldwide is celebrating it’s 10th birthday this December. I don’t know about you guys, but we sure think this calls for a little get-together! On December 8th we are setting up a very exclusive re-launch event with the help from the nice people from PACKED and SMartBe. 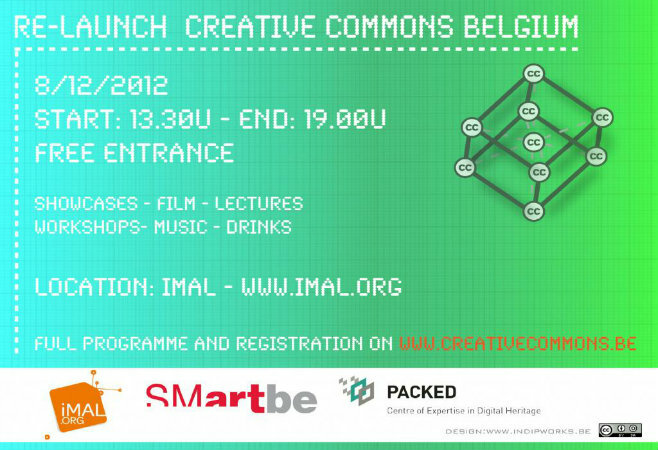 The event will be hosted by iMAL in their lovely location in the heart of Brussels The programme will consist of both showcase moments where Creative Commons artists and projects will be presented to you and an informative track where we will provide you with some more info about the licenses, the CC-BE team, our vision and goals for the next year and a round table discussion about the future of copyright with some prominent guests. Afterwards the bar will be open and we invite everyone to come and find us to talk about their interest in CC! The event will be in French, Dutch and English and it is completely free. We do ask you to register though, so we can keep track of the number of guests we can expect. There are only 100 tickets available, so don’t hesitate to register if you want to join us!